I remember my first box of crayons as a child, what possibilities that this box of crayons could give me. It was an encyclopedia of colors that set the stage to my imagination; I love color; multiples of colors, hues, patterns, and shapes and how they are able to tell us a story. As a freshman in college, I took a class in ceramics and was fascinated with this material called “clay.” The Windy City brought me here, where I continued to sculpt and to earn my M.F.A. at the Art Institute of Chicago. Wanting to share this wonderful material with everyone, I established my own business in 1981 called “Whitehead Studios.” I designed and manufactured custom, hand-painted ceramic tile, with 27 distributors all over the United States for both residential and commercial work. From 1983 to 1989, the studio maintained an exclusive 1,500 square foot show room and 7,000 square foot production facility in Chicago’s Merchandise Mart. Since 1996, the studio has collaborated with architects, designers, public officials, as well as individuals, corporations and the public community in developing art projects. Combining creative ability and experience from conception to installation. To compliment my commercial artistic ventures, I also focused on expanding my non-commercial portfolio. 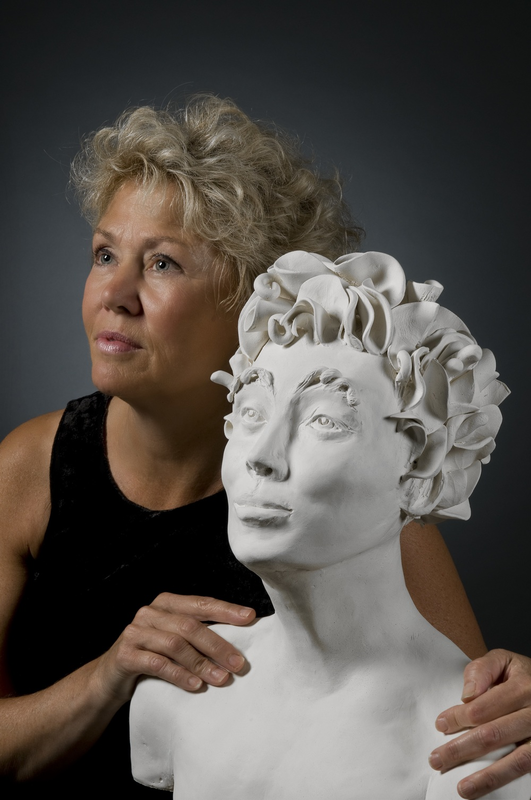 I exhibited my sculpture work throughout the 80’s in galleries and shows ranging from the Loop Show in Chicago, the 37th Illinois Invitational Contemporary Art Exhibit, to a two woman show at the ARC Gallery featuring 2,000 square feet of sculptural work and chalk drawings. It was the invitation to the 50th year anniversary at the ARC Gallery that really kicked my sculptural work back into gear. Over the years, I have continued to pursue my commercial and fine art. Most recently, my work has been exhibited within the Chicago-land area at shows such as the Wells Street Art Fair, the Palette and Chisel Academy of Fine Art, and Art Fair on the Square.